Most of Isaac's work was shot using Nikon's D600 and D300 digital cameras along with a range of lenses which include: Nikon AF-S Nikkor 300mm 1:4d, Nikon AF Nikkor 24-120mm 1:3.5-5.6d, 12-24mm f/4G ED-IF AF-S DX Wide-Angle Zoom-Nikkor and the 105mm f/2.8G ED-IF AF-S VR Micro-Nikkor. A few select, older and limited images were shot using Nikon's D200 and D70 digital cameras, or the F100 camera in 35mm format and making a high resolution scan of the transparency film using Epson's 4990 flatbed scanner, which scans at 4800 x 9600 dpi and has a DMax of 4.0. Using Epson's technology matches closely to drum scanner detail. Images are generally scanned to 20 x 30 at 360 dpi with medium sharpening. Isaac's artwork is offered in premium and fine art photo paper media. Premium color and black and white artwork is printed on either Hahnemühle's fine-art Baryta, Ilford Galerie or Epson Premium Gloss papers. Select black and white images are offered on Red River's Polar Pearl Metallic paper that closely matches the look of photo lab metallic prints. These are the perfect mediums for artists representing their works on museum quality professional photographic media. These products result in vibrant images that are highly resistant to gas and UV fading. Upon request, limited gallery wrapped artwork is available on fine art canvas using Premier Art's Water Resistant Canvas for Epson, a technique that is considered a true "Giclee" product when combined with Premier Art's Print Shield spray.Most photographic artwork, particularly canvas is hand-sprayed with UV protective coating to further extend image life. Isaac's photographic images are professionally printed using Epson professional series printers and Ultrachrome K3 pigment-based inks, which have longer fade-resistant ratings. Using the latest in Epson's technology in printers and pigmented archival inks, Isaac can produce consistent and long-lasting quality prints ensuring every print is as identical as possible. The Epson series of printers help provide that perfect balance of hue, color and saturation, which makes Isaac's vividly striking photographs true pieces of art. Images are printed full frame format and vary from traditional "exact" sizes (e.g. 9.5" x 14" vs. 11" x 14"). This may further include occasional cropping techniques used to enhance the visual experience. While digital imaging is used to enhance, print and display Isaac's artwork, manipulation is limited to classic darkroom techniques (burning, dodging, exposure compensation, hue, saturation, etc.). In this manner Isaac stays as true as possible to the original image captured during that moment in which it was taken. Aluminum Artwork - - New! 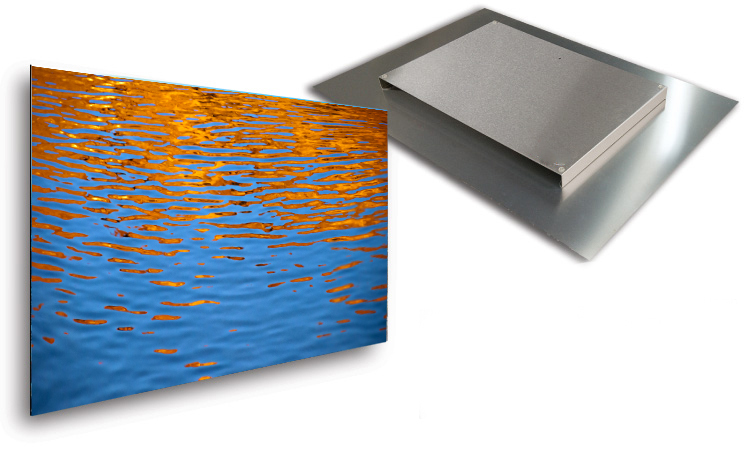 Give artwork a floating effect in true high-def with photographic imaging on anodized aluminum. Available in recessed frameless aluminum or float mount options, artwork comes ready to hang. The process is a dispersed dye technique where the dyes are embedded into the finish and the aluminum through heat and pressure. All material, including the framing and mounting is over 91% recycled material with no VOC’s or harmful chemicals released into the air. Choose from two available finishes! Recessed anodized aluminum frame. Instead of going to the edge of the print, it is brought in 3" from every edge on the back, which gives the appearance to be floating roughly 1½" off the wall. to create a box like effect that mounts behind the imaged aluminum. As with the recessed frame, this option floats artwork roughly 1½" off the wall. It has a lasered hanging hole for ease of mounting and ready to hang. In addition to purchasing individual prints, Isaac’s artwork is sold as matted sets to further enhance their look and durability. Matted artwork comes in either black or white mat media with acid-free white or black core and 1/8" or 3/16" foam backing. Foam backing helps resist most warping and denting and to extend print life. All matted sets are displayed in clear plastic protective coverings and come with a certificate label signed by the artist.